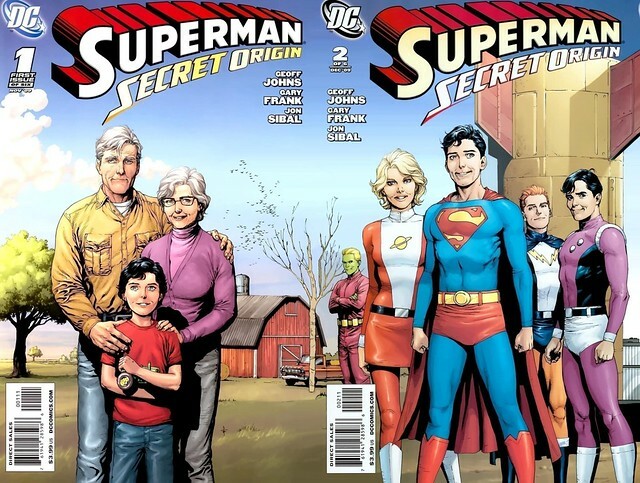 The final chapter of Superman: Secret Origin was published last month. I thought it was a great re-take on the Superman myth, bringing back all the classic pre-Crisis elements (the Legion, Krypto, Lex Luthor in Smallville) and at the same time updating the setting. Gary Frank's artwork, of course, was just superb. He's the perfect artist for Superman. Did you know that covers for all six issues were designed to be joined together? Here are the assembled covers for the first two issues. This is my favorite part of the Superboy story. You've got young Clark Kent standing next to Jonathan and Martha. Right next to them, Superboy stands next to the only other teenagers he can relate to: Saturn Girl, Lightning Lad, and Cosmic Boy. Braniac 5 stands a bit disdainfully in the background. There is one element with the Legion that is hinted at but never fully explored. Saturn Girl is telepathic and she's also a beautiful chick. Clark is obviously attracted to her and she can read his thoughts. At this point Imra is not dating Garth and seems to have a great deal of affection for Clark. Can't see why nothing ever happened there, it would have thrown a good romantic wrench into the lives of these kids. 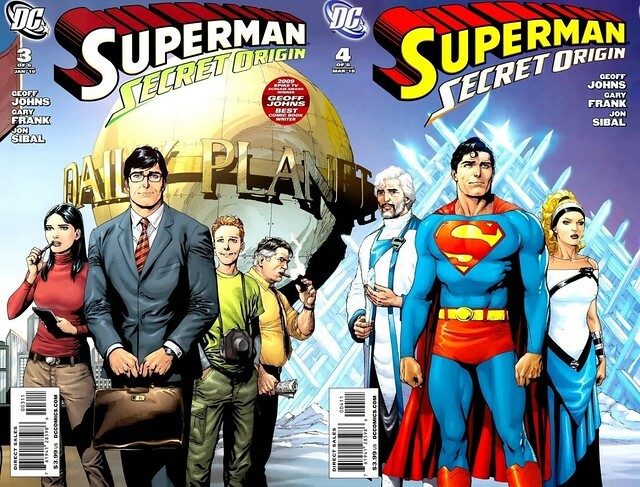 The covers for issues 3 and 4 feature the Daily Planet gang standing next to Kal-El's Kryptonian family. As with Gary Frank's other work, Clark Kent/Superman very much resembles the late actor Christopher Reeve. Jor-El resembles Marlon Brando. I would even say that Lara (Superman's mom) resembles the actress Susanna York (from Richard Donner's movie), updated as if she were a hot 30 something actress working today. Frank's approach to Lois, Jimmy, and Perry White are more in line with the traditional Superman comics. He makes Lois Lane attractive and Jimmy looks younger than usual. Here are all six covers joined together, click on the image to see the whole thing in Flickr. Nuff Said!